As with every series of Great British Bake Off I watched the Pies and Tarts episode and immediately wanted to eat bake something pastry based. In this case, watching the contestants bake signature custard tarts made me crave egg custard tart – so it had to be done! There is a bit of a twist with this bake though. I work in a large office building where we are lucky enough to receive promotional samples of various products quite regularly, and I recently acquired some sample cartons of Alpro soya single cream. 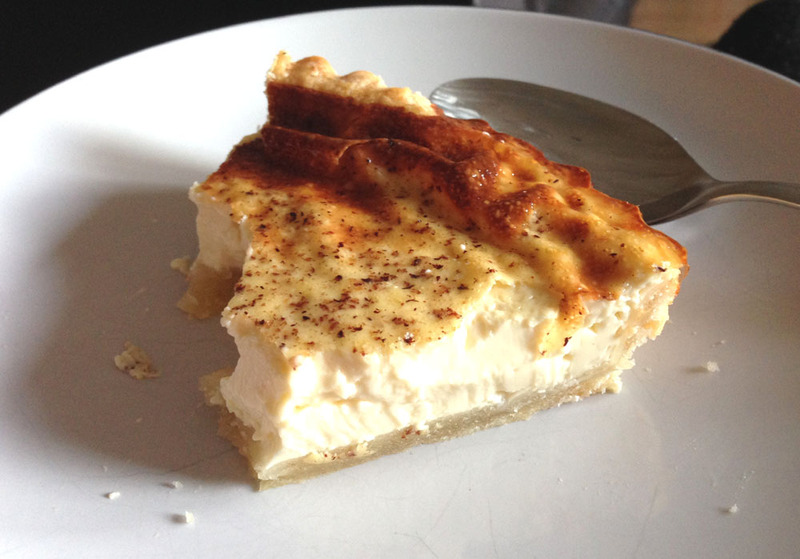 It’s been sitting in my fridge not knowing what to do with itself until now, so I decided I would trial it in this egg custard recipe. 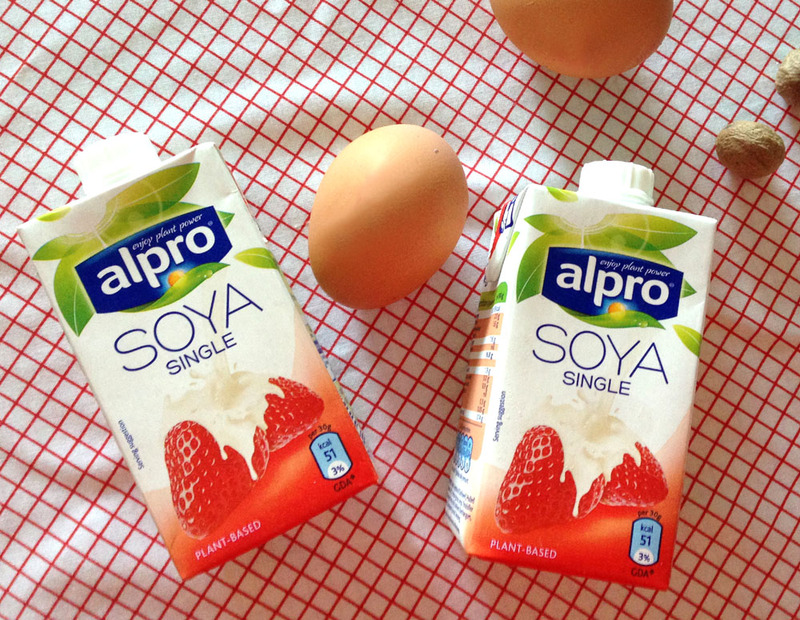 This dairy-free Alpro soya cream promises to have 42% less fat than single dairy cream, so (apart from the pastry) this is healthier version of an egg custard tart. And I thought the results were just as delicious as if I’d used dairy cream. By the way, I’ll apologise now for not making my own pastry. Life’s too short if you’re not a contestant on the Bake Off! Roll the pastry on a floured surface, taking care not to stretch or tear the pastry, until it is about 4mm thick and large enough to line your tin. Line a tart tin with the pastry. Mine was a 23in loose-bottomed tart tin, 3.5cm deep. Use a ball of offcut pastry to gently push the pastry lining into all the edges of the tin, and then trim the top to the edge of the tin. Prick the pastry base with a fork and brush all over with egg wash. Place the pastry-lined tin in the fridge to keep cool whilst making the filling. Warm the cream in a pan until it is gently simmering. Beat the eggs, egg yolks and sugar in a bowl. Be gentle to avoid creating bubbles. Pour the warmed cream over the egg mixture whilst stirring gently. Avoid over-heating the cream as this will curdle the eggs. Then add the vanilla to the mixture. Pour the mixture through a sieve into the pastry base. I found it best to do this with the tin already in position on the oven shelf to avoid spillage when moving the tin. Grate some whole nutmeg over the surface (to taste). Bake in a preheated oven at 220°C for 10 minutes. Then reduce the temperature to 180°C and bake for another 25 minutes, or until the custard is just set and wobbles slightly. 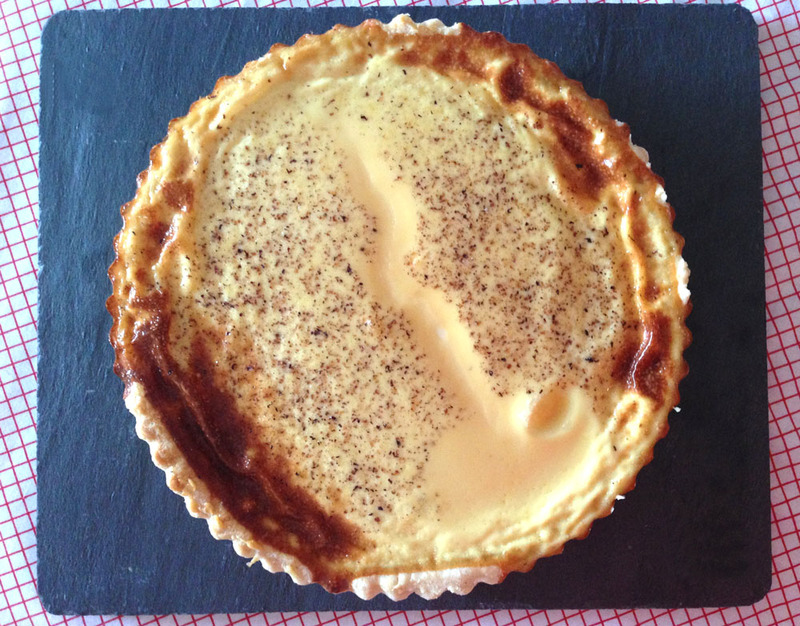 Let the tart cool and the custard will continue to set. Enjoy a slice with a pot of tea! 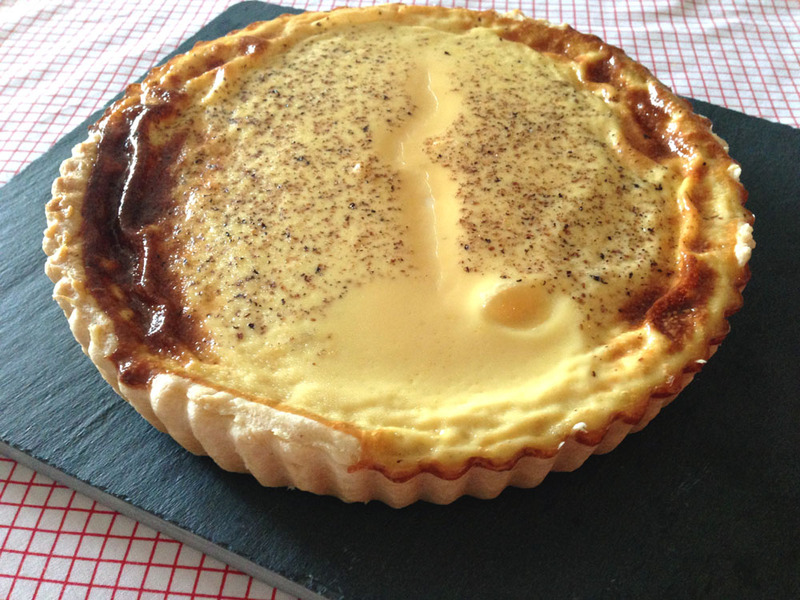 I’ve wanted to make custard tart for so long! I’ve never even made custard from scratch before!